There is no place I’d rather die than in Duluth, Minnesota. Likewise, there’s no place I’d rather reinvent the notion of vocation. This is the land upon which I choose to live, and to live abundantly. For 12 long toilsome years I found myself latched on, clutching to a gigantic and seemingly life-sustaining corporate teat. What began as a temporary arrangement to qualify for a mortgage, almost imperceptibly transformed into a major epoch of my life. Now, two months after the relationship was unexpectedly severed, my sight is being restored. The fog is lifting. My vision is clearer than it has been in years. Cut loose into a current of limitless possibilities, I find myself on the cusp of a midlife realignment. Losing my job was the best thing that could have happened to me and my family. A lifetime of corporate servitude was becoming a distinct possibility. The keyhole of the shackles that bound me seemed to be rusting shut. Having a young family renders the current situation remarkably inconvenient. But if not now, when? Therefore we, me and my family, seek to secede economically from an unholy and unjust system that grinds millions into dust. We choose to quietly step away from an economy that runs on the dictates and desires of a far off few. We will eschew a system that thrives on exploiting people and resources. Our family is one, and we are in this together. Previously my wife and children had very little concept of what I did with my mind and hands. Now we seek to function as a single economic unit pulling the same load together. Wage labor, brought on by industrialization, separated one’s work from the home for the first time. Prior to this most economic activity took place within the context of the household. Entire families formerly worked the fields together or engaged in a trade. While great good resulted within society, one of the consequences was that the family shifted from being a unit of production to a unit of consumption. Economic activity for the average family became going to a store and shopping. Business leaders in ivory towers, great cultural beacons, became fixated on maximizing short-term shareholder gain. The practice of building long-term value based on trust is considered antiquated and unrealistic. People are considered utilitarian commodities to be bought and sold. Wealth is increasingly concentrated in the hands of a few. We resolve to pursue a more traditional path by making our lives dependent upon our community, neighborhood, and household. A transition to a creative economy is underway, and Duluth is poised to blossom. Our family will struggle and strive to survive by our wits. In the end I believe this will make us all more grateful for every magnificent provision we receive. Rather than counting on a predictable paycheck, for example, every sale of my wife’s paintings will be greeted by shouts of thanksgiving. 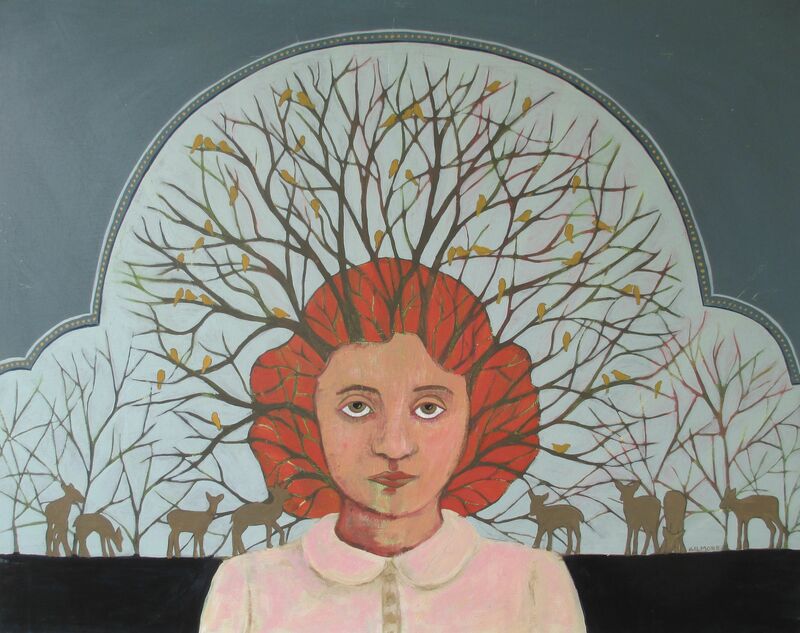 Join us next Wednesday, October 1st, from 5 to 7 pm for the opening of her art show at the Red Mug Coffeehouse in Superior, where her surreal paintings will be displayed all month. Go to http://www.shawnagilmore.com for further details. I will continue to plug away with misguided dreams of writing as a career while finishing a book that chronicles my remarkable transformation from a lonely existence as a child mired in extreme hoarding to a life of freedom and abundance in northern Minnesota. Ironically, I find similarities to the current situation of being suddenly weaned from my corporate benefactor. It takes time to transform from a “cubicle” mentality to an expanded mind that seizes opportunities in the new creative economy. We might fail, but we’ll do so together. Even our kids are indispensable to the effort. They have joined in the action since their allowances have ceased. Our daughter is currently concluding her first foray into entrepreneurialism by placing the last of her hand-tamed baby hamsters into good homes. One tremendous gift that is enabling families to take risks in pursuing their dreams is MNsure. Never before have individuals had affordable access to health insurance outside of traditional employment. Having this to fall back on has removed a heap of stress, and we’re grateful.